COMMENT | The game is on, I guess. What is touted as the mother of all elections is upon us. With the dissolution of Parliament, Prime Minister Najib Razak has finally rolled the loaded dice. He has stacked the deck in his favour and his minions are overseeing the rigged game. But does Najib really fear a Malay tsunami? The Umno grand poobah claimed that he did not believe that there would be a Malay tsunami because this would mean a rejection of Umno. This is a strange thing to say because it essentially also means that the Umno president believes that if more Malays voted, they would reject Umno. This, of course, is conventional politics. Political hegemons the world over understand that large voter turnouts usually mean that the established order is under threat. It is a little different here in Malaysia because the established order is not under threat, merely a political operative struggling under the weight of numerous corruption scandals. Why would more Malay voters reject Umno? More importantly, what is the opposition offering the Malay community which is radically different from what Umno is offering? Besides the usual pabulum that both sides make about race and religious relations in this country, about the only issue that the Malay opposition keeps harping about is that the Umno grand poobah is a kleptocrat. In other words, it is not about a rejection of Umno but rather it is a rejection of Najib. After all, Dr Mahathir Mohamad, the Pakatan Harapan PM-designate only hooked up with the opposition after he failed to get the current Umno grand poobah to step down. Umno says it is a champion of Malay rights, while Bersatu claims that Umno has betrayed Malay rights through the corruption of the Umno grand poobah. I have made this argument before, that if Umno was not a centre-right party and if most Malays did not want what Umno was offering, PAS would have made great inroads into the political mainstream of this country. The fact that most Malays rejected the Islamism that PAS offered and were content with the control of the Umno state, should say something about the Weltanschauung of the Malay voting demographic. 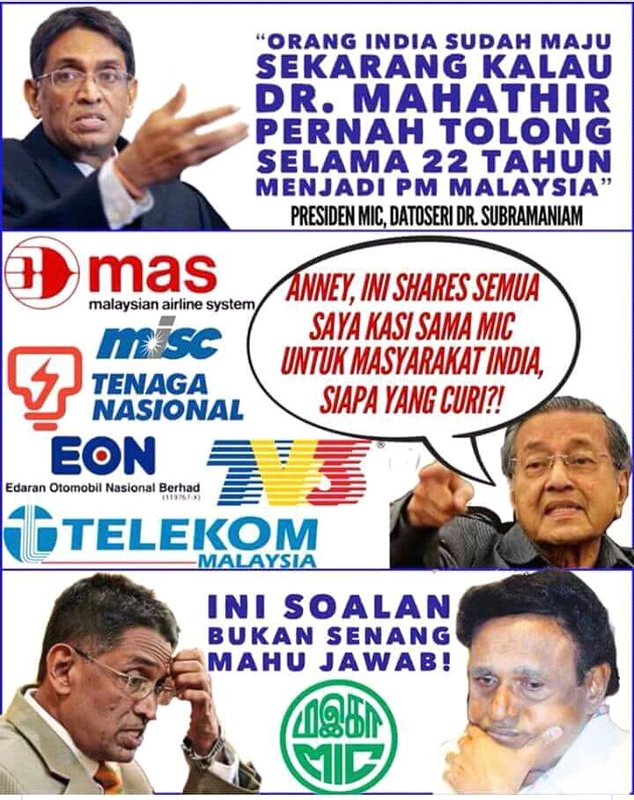 The fact that PAS became mainstream was not anything that Umno did but because of the opposition. Whether they remain mainstream remains to be seen. While some would argue that this was more of a legacy issue than a corruption issue, the reality is that the corruption scandals of the current Umno grand poobah have become the major issue at this upcoming election. An Umno insider recently hissed that it was difficult to mount a successful defence for their great Bugis warrior because Najib was the face of the 1MDB scandal and even if people really did not understand the minutiae of it, they had an easy reference for the scandal in the form of the Umno grand poobah. This is why the Umno state which usually could get away with most anything in the Malay community had to resort to such measures as creating an anti-fake news law – which essentially meant that you could not talk about the 1MDB issue - and extreme gerrymandering – which essentially meant that even if you did not choose Umno, Umno chose you. This also means erecting barriers on the validity of Bersatu through bureaucratic legalese. The temporary dissolution of by Registrar of Societies (ROS), while most probably legal, goes against the spirit of democracy, but it is also important to note that Bersatu, knowing the kind of tricks the ROS would play, should have been scrupulous in conforming to all the necessary “paperwork” and hoop jumping that they knew would come their way. The fact that they did not do this say more about their sense of entitlement - or perhaps a deeper strategy; that would be reckless but impressive – than it does about the mendacity of the Umno state. But really, all this goes beyond the fear of a Malay tsunami. If Umno was really sure of its traditional bases then why is it that Umno is going all out to court the rural vote and placate the civil service. Needless to say, the civil service was always a reliable vote bank because they understood that Umno was always a reliable paymaster. Except these days, with the propaganda of the GST (I say propaganda because I am for it and this issue has been propagandised by the opposition) and the numerous “reports” of financial scandals, the sentiment is that Umno cannot fulfil its entitlements programmes for the civil service. Whether this is true is beside the point. Umno understands that this is the perception, and the civil service has always been the main vehicle of social mobility for the Umnoputra class. Nobody cares, certainly not the civil service class, as to why prices rise but what they understand is that the government is somehow involved. Nobody cares about China’s investments only that they fear that the Chinese could take over because Najib is weak. Encouraging “yellow fever” is what the Malay establishment does when it wants to galvanise the Malay vote. In other words, this really isn’t about Umno the kleptocracy. It is about Umno the kleptocracy under Najib. Claiming that if the Chinese community wanted representation in the government they should vote BN is a played-out strategy. The reality is that the Chinese who vote opposition think they get better presentation in the opposition even though they are not in power and would get better representation if they get into power with Bersatu. And let’s face facts. There are many in Umno who are annoyed that there should even be Chinese representation in BN, especially now that the Chinese community has abandoned Umno. Right-wing Malay thinking revolves around, why bother with the fig leaf of representation when all that is needed is the majority Malay/bumiputera base? This is why the great fear of Umno has always been the idea of a “split” in the Malay community. This idea, of course, is the strategy of the opposition. The Malay base, which is made up of various voting blocks, is what is really of concern for Umno. A Malay tsunami would be dangerous but the reality is that Umno fears that the base is unstable. There is a viral video featuring the Harapan PM-designate in which he prophesies Umno’s demise by the year 2020 (but the decline would start earlier) because he claimed that the Malays would be bored of the money politics of Umno and that the Umno leadership would be squabbling amongst themselves for prestige and power instead of ‘bangsa’ and ‘agama’. If this worries Umno, they should take heart because he also claims that the Malays would not support any other Malay-based party, which should worry the opposition.